Are bruises a sign of nursing home abuse? When your loved one is unable to care for himself, it's understandable to be worried about the risk of nursing home abuse. Although bruises on their own may not be evidence of abuse, they could represent a sign of a problem with the care your loved one is receiving. Aging makes elderly people more prone to bruising because their skin is thinner. Additionally, the tissue underneath becomes more fragile as someone ages. Some medications that are commonly used by the elderly can make bruises more common or severe in nature. For example, blood thinners such as warfarin (Coumadin), enoxaparin (Lovenox), or clopidogrel (Plavix) are often associated with increased bruising. Doctor visits can cause bruising for seniors who need intravenous (IV) procedures performed. Seniors who have trouble with balance and coordination can accidentally fall and injure themselves. Individuals with dementia may engage in self-harming behaviors as part of their condition. The complexion of your loved one can also make a difference. Fair skinned people tend to have more noticeable bruises, regardless of age. Bruises on the elderly often take longer to heal than bruises on younger adults, which means they should be monitored closely. In a young, healthy person, bruises fade away within two to three weeks as the body absorbs the blood pooling in the ruptured vessels near the skin's surface. Bruises will be reddish when they first appear, turn bluish black or purple when healing begins, and then become yellowish green or a lighter brown before they disappear. In the elderly, bruises can take several weeks or even months to heal completely. Keeping the bruised area elevated higher than the heart during the first 24 hours and using alternating cold and warm compresses for 20 minutes at a time can speed healing by keeping swelling and inflammation to a minimum. Bruises that harden, become increasingly painful, grow in size, or do not seem to be healing require a thorough medical evaluation to rule out more serious internal injuries or a medical condition affecting healing. Location. 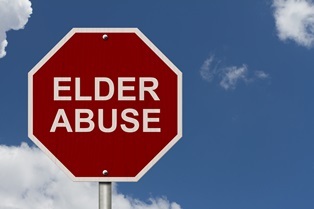 A study by the National Institute of Justice found that bruises on the torso, neck, or head are more strongly associated with elder abuse than bruises on other locations on the body. Bruises that are the result of a genuine accident are more likely to occur on the hands, arms, feet, or legs. Pattern. A cluster of small linear bruises could indicate that someone grabbed your loved one forcefully enough to leave finger mark bruises. Repetition. A single bruise could very well be an isolated incident. However, bruises that repeatedly occur on the same part of the body are unlikely to be accidental. For example, frequent bruises on the wrists and/or ankles may suggest that restraints are being used on your loved one. No concrete explanation. If you receive a vague or contradictory explanation when you ask about bruises on your loved one, it’s cause for concern. Accompanied by attitude changes. If your loved one seems anxious or fearful around caregivers, this suggests that abuse may be occurring. Depression and withdrawal from friends and family may also be signs of nursing home abuse. If you think that your loved one is being mistreated, it's important to act quickly. Nursing home abuse often progresses in intensity, especially when the abuse is due to inexperienced, overworked, or frustrated caregivers or a prevailing problem of understaffing in the facility. Bruises may very well be followed by broken bones, burns, or other severe injuries. When you have a problem with the care your loved one is receiving, you should first attempt to resolve the issue with the nursing home administration. If you are still not satisfied that your loved one is being properly cared for, you should consult an attorney to learn more about filing a nursing home abuse claim. Contact us online or call our office directly 318.541.8188 to schedule a no-fee consultation.